Some days ago, John Leahy, Airbus COO Customers, unveiled at a press conference in London the new figures of 2011-30 Airbus’ Global Market Forecast (GMF, PDF 28.8MB). Last year, I already published a comparison of both Airbus’ and Boeing’s forecasts (Current Market Outlook, CMO, PDF 3.2MB). You can find below the update of such comparison with the latest released figures from both companies. Comparison of Airbus GMF and Boeing CMO 2011-2030. Boeing sees demand for 15% more aircraft with a 21% more value (excluding regional a/c). On the other hand, Boeing forecasts about 600 twin-aisle and 4,000 single-aisle more than Airbus, clearly pointing to its point-to-point strategy. In terms of RPKs (“revenue passenger kilometer”), that is, the number of paying passenger by the distance they are transported, they see a similar future: Airbus forecasts for 2030 12.3 RPKs while Boeing forecasts 13.3 (in trillion). Both manufacturers have drastically increased their single-aisle forecast: +1,300 a/c in the case of Airbus and +2,200 in the case of Boeing. in the case of Boeing, could it be that the numbers were raised to convince a sceptic board of directors of the launch of the 737 MAX? 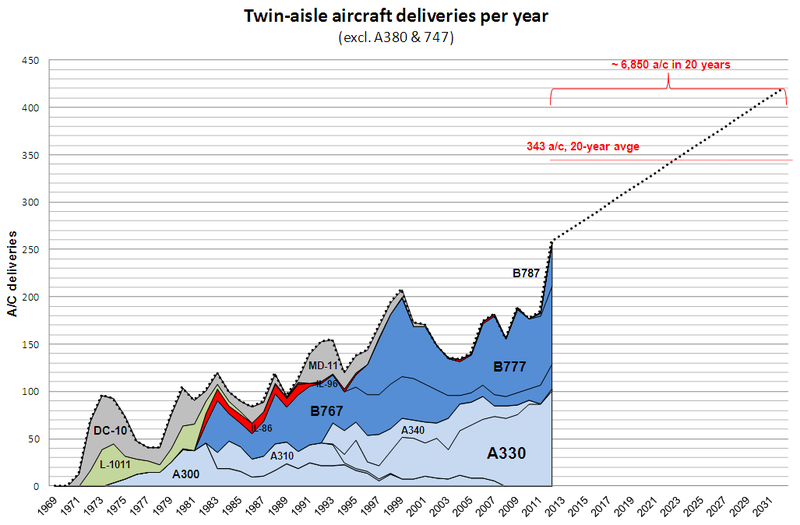 In general all numbers have been increased: single-aisle (as mentioned above), twin-aisle (between 50-150 more), large aircraft (between 40-80 more), value of aircraft and RPKs… it seems that for commercial aircraft manufacturers not only the crisis is passed but they see a rosy future lying ahead. Again, I strongly recommend both documents (GMF and CMO) which, differences apart, provide a wealth of information of market dynamics. I am especially happy to have encountered this year again full version of Airbus GMF, not only a short one [PDF, 4.7MB].